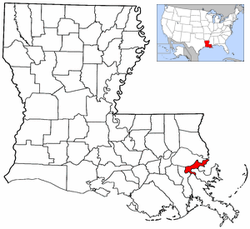 Ìnagijẹ: "The Crescent City", "The Big Easy", "The City That Care Forgot", "Nawlins" and "NOLA" (acronym for New Orleans, Louisiana). New Orleans (pípè /nuː ˈɔrliənz/ or /nuː ɔrˈliːnz/, locally IPA: [nuː ˈɔrlənz] or IPA: [ˈnɔrlənz]; Faranse: La Nouvelle-Orléans [la nuvɛl ɔʀleɑ̃] ( listen)) je ilu ni orile-ede Amerika ati ilu titobijulo ni ipinle Louisiana. ↑ "Population Estimates - 1 July 2008". census.gov. 2009-12-22. Retrieved 2010-01-08. Àtunṣe ojúewé yi gbẹ̀yìn wáyé ni ọjọ́ 14 Oṣù Kẹ̀sán 2018, ni ago 00:13.